Visitors are warmly welcomed at Mt. 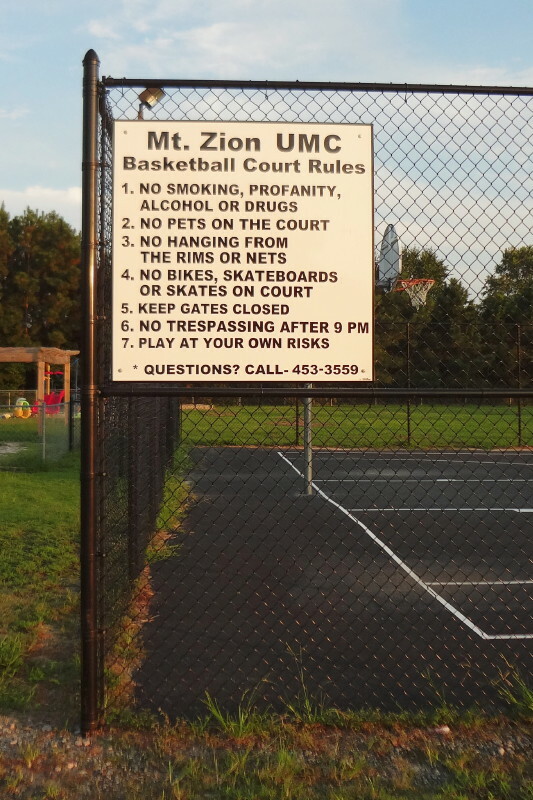 Zion UMC. You may enter by the front doors or the back doors which are handicapped accessible. A paved road behind the church leads to stoplights on US 158/Caratoke Hwy in Currituck County, North Carolina. We invite you to view a video of a few of our members sharing Testimonies shared about Mt. Zion UMC or to view submitted written Personal Testimonies at the bottom of our Bible Studies page. Sunday School classes for all ages begin at 10:00 AM followed by Worship at 10:55 AM. Dress is casual and our usher-greeters can help you with seating or questions. Our minister, Pastor Dawne Hollis-Custer, and others will greet you during our traditional Passing of the Peace - when a friendly handshake and the "Peace of Christ" greeting is extended to all. You will experience Bible based sermons, a variety of music, special skits, friendly folks and we hope you recognize the special presence of the Holy Spirit. After the service or any other times, you are also invited outdoors to our gardens, playground and basketball court. Everyone is also invited to participate in hands-on Ministries. Usher-Greeters will welcome you with a church bulletin and will answer any of your questions. Holy Communion is offered on 1st Sundays and on special Holy Days. Our Mt. Zion Prayer Garden is open to the community. Click on the photo to visit the Prayer Garden & Food Garden website. Our Community Food Garden helps provide food to the Lower Currituck Food Pantry. Our Children's Playground is open to the community as long as visitors provide adult supervision for safety. Our Basketball Court is open to the community. Click on photo to view Basketball Court Rules. During Worship Pastor Dawne or a volunteer shares a Children's Message followed by a Children's Church, a special time which incorporates an age appropriate bible lesson and craft in a classroom. Weather permitting, leaders and children may also visit our church playground. A staffed and safe Nursery is provided for infants to preschoolers during the Sunday School and Worship hours. *Baptism is considered a special holy occasion that follows a traditional time of spiritual preparation. Contact our pastor if you or your family would like to receive this holy sacrament. *The Lord's Supper, also called Holy Communion or the Eucharist, is shared the first Sunday of each month and on special Holy Days. All are invited and welcomed to the Lord's table. If you have questions about any part of our church service or our beliefs, please contact our pastor through the church office. A fun way to learn more about United Methodist Church traditions is to visit Chuck Knows Church. For persons interested in using our church site facilities, our Mt. Zion UMC Facilities Use Form is posted below.